My memories of childhood are surprisingly indistinct. When I say ‘childhood’, I mean up to the age of 11 or so (I recall the next 10 years with excruciating clarity). I guess I was happily growing up in the country, playing (OK, fighting) with my sister, having a generically uneventful time. 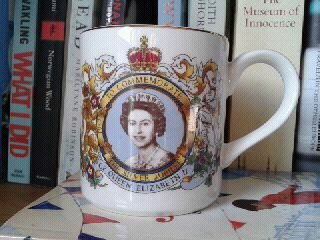 Of course a few things do stand out and one of them is the Queen’s Silver Jubilee celebration in June 1977. In my village, Winterslow in Wiltshire, there was a huge party on the recreation ground and we children were very spoiled. We were each given a free souvenir mug to mark the occasion. To be honest, I don’t remember the day very clearly at all; more than anything I remember the feeling. It was exciting! For once something was happening in a place where normally not much happened at all. My good friend Vanessa Stone posted a photo on Facebook about a year ago in which my little sister and I are clearly identifiable from behind by our dark and blonde ponytails in the crowd at the Jubilee party. Unfortunately, it’s now lost in cyberspace. I asked my Mum if she had any pictures of that day, to which she replied that people didn’t take photos of everything back then, and that is true. It was a very different time – a different world, almost. My sons sometimes think I’m making it up when I tell them all the things we didn’t have. We have what memories we can muster and now, with the publication of Jubilee by Shelley Harris, a fantastic means of triggering them. Jubilee is the first title of my Fiction Hot Picks for 2012 to be published and it’s set the bar high. Including it was a no-brainer because I keep my ear to the ground and I heard a lot about this book and what a great writer Shelley Harris is. 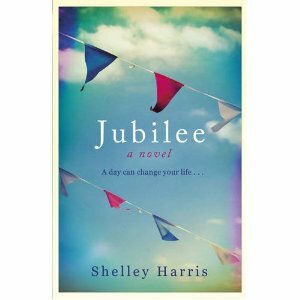 Jubilee tells the story of Satish Patel, a successful cardiologist who remembers his Silver Jubilee street party for reasons he would prefer to forget. He was 11 then and thanks to him a local photographer achieved international fame when a photo he took that day became famous as a symbol of multicultural Britain. Except that it wasn’t really like that. The Patels are an Asian family exiled to the UK from Uganda and the only non-white residents of Bourne Heath, Buckinghamshire. When Satish is contacted by a friend who wants to re-stage the Jubilee photo 30 years on, he is overcome with dread and panic. He has a new life now and like the original photo, what you see on the surface and what lies beneath are two very different things. This is good for characterisation in any work of fiction, but I found the character of Satish exceptionally complex and intriguing. Harris moves seamlessly back and forward between the past and the present, mostly from his point of view, but sometimes that of others involved in the street party. From the very beginning, even before the reunion is announced, we realise something is not right with Satish; he isn’t functioning properly and he’s hiding things from his wife and children. He’s damaged and we want to find out why. The story is so compelling that I barely put it down for the two days it took me to read. The desperation and instability of Satish as an adult is so convincing that I felt physically sick with anxiety watching him perform heart surgery in no fit state. I felt a bit guilty for not liking him more knowing what he’d been through, but he interested me so much I would have liked to know more about his life in between the two timeframes of the novel. However, as a boy he really tugged at my heartstrings, stoically accepting the casual racism his family face every day: a neighbour doesn’t want him to play with her daughter because she thinks he’d be better off ‘with his own kind’; kids he thought were friends can be terribly cruel and spiteful. Where I grew up the only non-white faces belonged to the owners of ethnic restaurants (and it hasn’t changed much) and I recognise the society being portrayed. Shelley Harris moved to the UK herself in the early 1970s from Apartheid-era South Africa and has a finely-tuned radar for exposing contradiction and hypocrisy, provoking questions about immigration, national identity and what it means to belong. Was Britain really so Great then, and is it now? That, above all, is why this book deserves to be a hit in the Queen’s Diamond Jubilee year – it fuses nostalgia and contemporary relevance so cleverly. For anyone who remembers Britain in the ‘70s it’s a hugely enjoyable blast from the past, with the music, clothes, cars and so many other things that I’d completely forgotten about: Wavy Line corner shops, Miners eyeliner; those souvenir soaps with the indestructible Queen’s head on. Don’t worry if you weren’t born then or were living on the other side of the world – anyone who wasn’t here in 1977 will feel as if they were. It would be hard to read the book without reflecting on how much things have changed, or how little. Jubilee will take you back – rose-tinted spectacles optional. This sounds fascinating, and I love a book that moves back and forth between past and present. Will put this on my ‘to read’ list for 2012! Susan, from our many literary exchanges online, I think our taste in books is quite similar, so I’m sure you will enjoy Jubilee. You must let me know if you are ever in London so we can talk books face to face ! Thanks so much for this lovely review, Isabel; I’m really chuffed that you enjoyed the novel. Your own Jubilee story is great, and I wondered how you’d feel about posting it on the book’s Facebook page (just search for ‘Jubilee’), where we’re collecting people’s experiences. Well thank you Shelley for writing such an amazing debut novel and for being an inspiration to up and coming writers like me! Yes, I would love to share it on Facebook when I get a minute, and I’ll also add the FB link to the review. Wonderful review Isabel..my goal this year is to read all your recommendations!! PS did you get the photos and separate e-mail..they seemed to go to different places..? Wow, Ness, you are in for a busy reading year ! So glad you are enjoying the reviews and listings. I love the thought of you going into a bookshop in Montreal looking for the ones I’ve recommended. I’m sure you will enjoy Jubilee and that Mike would too, having grown up in the UK. I love this review, not just the technical critique of the book, but the introductory story of you and your sister. I too have clouded to no memories of my first 10 years, which drives my wife crazy 🙂 but from then on I am pretty good. Excellent review as always and I look forward to reading the book. Glad to know I’m not the only one with the hazy memory, Peter! In actual fact, things have started to come back to me a bit since starting this blog, because to my surprise I’ve ended up writing about my childhood several times. It’s the everyday stuff that is hard to recall other than in a very general way. In school holidays, I spent a lot of time in France growing up and I remember that much more clearly. I don’t know whether this really is my earliest memory or whether I just heard the story so often, but when my sister was born and I was 2 yrs 8mths old, the first time we met I hurled the tube of sweets I’d been given as a ‘we have a new apple of our eye’ consolation prize across the room. Such a sweet nature….! Yes, Jubilee is a fine book. Living in outer Croydon in Godforsaken zone 6 myself , I normally avoid reading anything set in a suburban world like the plague, but this is good: a good story and good writing. Thanks for recommending it.